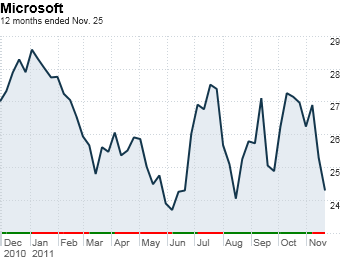 The stagnation of Microsoft's stock for a decade has left many investors believing that the world's largest software maker is a wheezing company in decline. How else to explain Microsoft's 9 P/E at a time when large-cap stocks with similar growth, such as McDonald's, trade at 16? "The mindset right now seems to be `Apple is the future, so why would I want to own something that's the past?'" says Tom Forester, manager of the Forester Value Fund, which has 3% of assets in Microsoft stock. "But I see a lot of upside not priced into the stock and very little downside at nine times earnings -- 2012 could be the year of Microsoft." Hyperbole? Perhaps. But consider Microsoft's double-digit earnings growth, its $57 billion hoard of cash and short-term investments -- larger than most companies' total valuation -- and a huge installed base that includes 350 million Windows 7 licensees and 750 million users of its Office software. "They could easily double the dividend over the next three or four years," says Scott Davis, co-manager of the Columbia Dividend Income Fund. That dividend has already been hiked six times since it was initiated in 2003 -- a 900% increase -- yet the payout ratio (the percentage of earnings paid out as dividends) remains modest at 25%. The real juice could come from Windows 8. The new operating system hits the market in October 2012, but expect the buzz to begin in January at the 2012 International Consumer Electronics Show. Windows 8 is expected to drive sales of a new breed of super-lightweight laptops with Apple-esque touchscreens powered by next-generation Intel chips. Nomura Securities analyst Rick Sherlund calls Windows 8 "the next big thing," particularly for business users who want to create content and not just view it. Plus, system upgrades usually amp up Microsoft's valuation: According to J.P. Morgan, Microsoft's P/E rose four notches before the launches of both Vista and Windows 7, raising the prospect that the shares could begin to shake themselves out of a decade-long funk. Where do I put my money now? Markets up. Markets down. Turmoil in Europe. You can't even trust bonds. What's an investor to do? Our man's solution: simple and boring.